Wolfgang Pad Werks Polishing Pad Revitalizer is a strong citrus cleaner that penetrates foam or wool to release thick polishes, waxes, and compounds. Restore your foam and wool pads with this clean-rinsing detergent! Wolfgang Pad Werks Polishing Pad Revitalizer can extend the life of your pads! Wool pads can become caked and matted with polish. Foam pads become stiff and hard. Wolfgang Pad Werks Polishing Pad Revitalizer soaks into the fibers of wool and the pores of foam to release caked on car care products. Once the foam’s pores are unlocked, foam pads feel suppler and are better able to conform to the curves of your vehicle. Wool pads regain their polishing ability. Wolfgang Polishing Pad Rejuvenator can save pads that you might otherwise throw away. Saving pads saves you money. It just makes cents. Wolfgang Pad Werks Polishing Pad Revitalizer is a citrus concentrate that dissolves in water to create a powerful cleanser. This is not a soap! Soap leaves a residue. Wolfgang Pad Werks Polishing Pad Revitalizer rinses completely clean. Its safe on foam and wool, and it doesn’t alter the texture of the pads. Your buffing pads will be as good as new! This remarkable product comes packaged in a re-sealable plastic bag. Whatever your pad cleaning regimen may be, this 8 oz. bag will last and last. 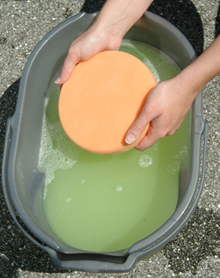 Just one scoop of Wolfgang Pad Werks Polishing Pad Revitalizer makes 3-4 gallons of fast-acting pad cleaner. The best part is, you can drop the soiled pads in a mixture of Wolfgang Pad Werks Polishing Pad Revitalizer and water, and leave them. The cleanser instantly starts breaking up oily deposits within the foam and wool without requiring you to scrub. Let the pads soak for up to 15 minutes and rinse. For heavily soiled pads or dry pads, you may need to agitate with a Foam Pad Reconditioning Brush. Before you begin detailing your vehicle, mix up a batch of Wolfgang Pad Werks Polishing Pad Revitalizer. As you use pads, toss them directly into the bucket of pad cleaner. The polish won’t have a chance to dry on the pad. Third time to purchase this product. I have used this product in the past and am confident it will continue to preform precleaning my polishing towels and pads. Easy to use with a measuring scoop and the product leaves tour pads ready to reuse! ProsComes with measuring scoop for accurate use- less waste and overuse! Throw a little in a bucket with some water and your pads in after using. Rinse off and they're clean. This product works! One scoop and you're golden. Watch freshly used pads and towels spew polish and wax from themselves. It was glorious. I had an old used pad lying around, never cleaned it for some reason. Had dried polish on it. Evidently it was so saturated with polish the detergent ate the entire pad apart. Chunks of pad floating everywhere. Just a fyi. I typically use APC to clean pads which works well. Soaking in the wolfgang rejuvenator is better. It lifted out poorboys PwS from a white pad which APC could not accomplish.